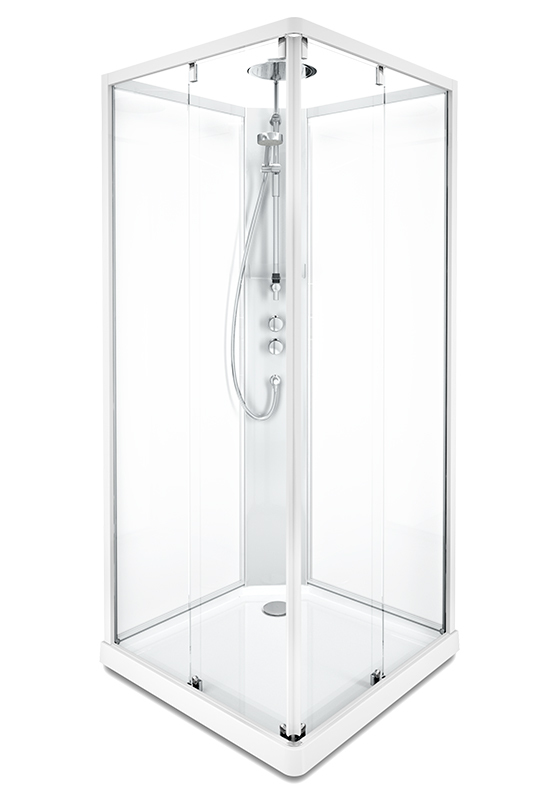 The IDO Showerama 10-5 Comfort is a luxury shower cubicle, completed with integrated thermostatic mixer, adjustable hand shower, rain shower and a spacious shelf. Easy installation, including fixing claws and pre-installed aluminum profiles on the back glass. No use of silicon. Wheels and adjustable feet underneath the tray. The shower cubicle is tested and approved by Sintef according EN 15200:2007. Integrated hair trap in the drain outlet. Sturdy tray in resin stone and easy sliding doors. Low entrance height of 128 mm. Profiles: White or aluminum White pillar with shower bar in chrome. Glass: Clear glass or a combination of clear glass on the front and frosted on the back part. Height: 2150 mm (Inside 2000 mm); Adjustment possibility from 60 to 85 mm.